Tropicana Casino is an online extension of the physical Tropicana Casino in New Jersey. For players who aren’t at the physical location, the online edition offers a wide array of games, along with other perks that physical casinos simply cannot provide. In this Tropicana Casino review, we will break down the pros and cons of the Tropicana Casino. Tropicana Casino offers a robust welcome bonus to its players, which serves as one of the high points of this Tropicana Casino review. The Tropicana Casino welcome bonus may rival that of any online casino operator today, offering new players up to $100 cash back on their first deposit. Sign up today with promo code “get10” to claim this offer. To become eligible for this Tropicana Casino welcome bonus, players must sign up for a new account, and make a deposit of at least $10. From there, players have seven days from the point at which they make their first wager as their promotional window. Players are then reimbursed on their net losses, which are calculated as your amount wagered minus any money won from those wagers, up to $100. The best part about this welcome bonus, though, is that it can be withdrawn instantly, with no prohibitive playthrough requirements to deal with. Whereas most online casinos make players use bonus funds some high number of times for them to become eligible for withdrawal, that is not the case with this Tropicana Casino welcome bonus, which is a huge plus for new players. Unfortunately, due to legal restrictions in the United States, there aren’t also welcome bonuses for sports betting or other sections that would exist at other online betting sites outside of the US. While that is inconvenient, the strength of this welcome bonus from Tropicana Casino is enough to neutralize any invonveniences. The problem with Tropicana Casino’s casino games is that they lack a lot of the benefits that other online casinos have from simply not being based out of the United States. Because of the legal restrictions in America, a lot of things that are common offshore are missing here, which can be disappointing and a low point of any Tropicana Casino review. To be fair, there are a decent number of variations of classic casino games such as blackjack, and enough slots games to keep slots players amused for a while. But with those being basic pieces of any online casino in this day and age, you want something more when it comes to a respected brand such as Tropicana Casino, something that they didn’t deliver quite how you’d want them to. One of the most glaring omissions from the list of games available at the Tropicana Casino is live dealer games. With Tropicana being an actual, physical casino in addition to an online casino, it makes sense why they wouldn’t want to eat into their physical casino business with a live dealer. But that does not make things convenient for the online casino player, who wants to have a good experience regardless of the business interests of the casino. In 2016, New Jersey’s Golden Nugget introduced live dealer play for their online players, and it seems that it’s the Tropicana Casino’s turn to catch up. For American casino players, simply having a mobile app to play their favorite games on can be a challenge, as offshore betting providers aren’t allowed to host their apps on American app stores. 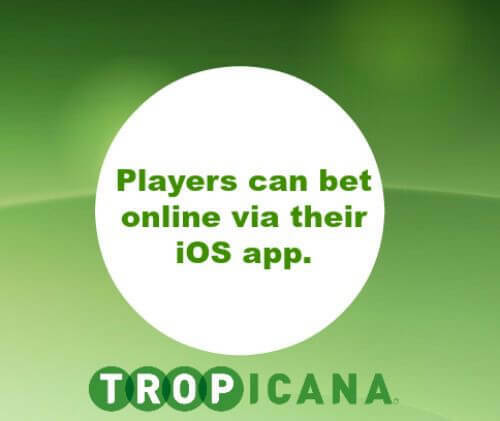 Tropicana Casino, however, is allowed to do so, as they offer an iOS app for players to enjoy. This app requires location services, as players are only allowed to play for real money while they are located in the state of New Jersey, but this is great news for American bettors who are usually not able to play via an app. This app does a nice job of bringing Tropicana’s games to life on mobile devices, which is a relief given the relative lack of games that Tropicana has to offer. The app earns high marks in this Tropicana Casino review. Tropicana Casino does offer other promos beyond their strong $100 cash back welcome bonus, earning them another positive mark in their Tropicana Casino review. Players can benefit from a refer-a-friend program that earns them $50 for every friend that they refer to an account creation at Tropicana Casino, which can be a source of big time funds if a player is persistent. Players can also join Tropicana Casino’s VIP program by contacting the casino. The perks to the Tropicana Casino VIP program are great, including birthday gifts, casino bonuses, and comped nights at their hotel to name a few. This is great for players who are frequent Tropicana Casino players, and definitely worth looking into. Elsewhere, players are able to earn Trop Points, one for every $40 spent on slots and one for every $100 spent on other casino games. These Trop Points can be used for casino credits once a player reaches at least 20 Trop Points. Players can contact Tropicana Casino by phone or digitally through email or live chat. This makes Tropicana Casino available 24 hours a day, which is great for players who don’t play within regular business hours. Players in the United States often have issues depositing to online betting sites due to restrictions by banking institutions, but that is not an issue with Tropicana Casino. Here, players can deposit using Visa and MasterCard, among other options. This earns them another 5/5 in our Tropicana Casino review. There is a lot to like about Tropicana Casino, from a great suite of promotions to convenient payment options for American players. The one big drawback is their list of casino games, but that isn’t the end of the world.